Patience by definition is the capacity to accept or tolerate delays, problems, or suffering without becoming annoyed or anxious. Patience is even one among the 4 P’s of Entrepreneurship Persistence, Perseverance, and Passion being other three. In business where there exists a lot uncertainty regarding market conditions, consumers, and economic conditions, patience becomes a vital quality for business owners and managers. The right amount of patience enables leaders to employ prudence and detach from emotions in the decision making and use logic and facts to substantiate their decision. However, too much patience may spark insecurities and even instability in the business. In the course of Business cycle, all businesses experience ups and downs. The best plans may get ruined overnight, and sometimes despite best efforts a fresh start is needed. This is where, patience becomes an essential virtue. In the course of a product life cycle, patience is a prerequisite in the introductory phase, where product is new; it often has slow initial growth as the marketplace needs time to learn and use it. 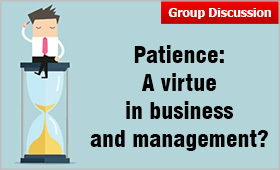 Some sectors like banking, investing, trading etc are associated with high level of patience. To evaluate and research the benefits and risks associated with critical business decisions. To identify practical goals and set realistic expectations on performance. In strategic planning, negotiations and critical thinking which have significant impact on the future of a business. To achieve the desired levels of success. Any endeavor that could potentially become a great success requires dedicated and persistent efforts. Optimism: When we are impatient, we are unable to work toward our business goals in a dedicated fashion. We have to be certain that rewards will come from adopting a more mature response. Patience can reward us with positive recognition, better sales, increased customer satisfaction or stronger profits. Prudent decision-making: When it comes to making sound decisions, patience is the most redoubtable resource. Patience keeps us out of the reach of negative thoughts that could cloud our judgment. Builds reputation: Successful business leaders set themselves apart from the rest of the pack by mastering the skills such as patience, communication, motivation etc. that lead to success. Patience enables us the ability to work steadily toward our goals. When goals are reached consistently, we build our reputation. Great reputations are developed through persevering, not giving up. Self- management: When we are patient, we take time to choose our response to a given event, rather than getting swayed by the moment. This allows us to maintain our cool even in unfavorable circumstances. With self-management we build trust in our capabilities. Positive work culture: Developing a culture of high engagement can only be achieved by being highly dedicated to what you are trying to achieve. Being patient increases our chances of achieving it. Patient people are better people, and effective managers, business leaders. With patience we treat other people with a sense of decency, which in turn increases the possibility they will respond in kind.